Transfiguration day celebrations and the 2nd semester opening service will be celebrated by the school Chaplain Fr. John Pungusia this Sunday morning. 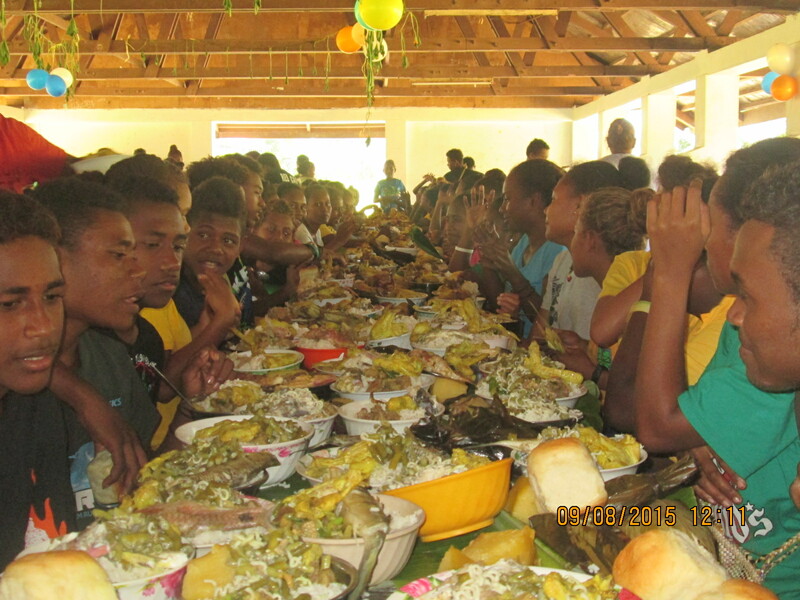 As customary feast preparations for the Kamaosi community is underway and will be held after the Holy communion Service on Sunday. There will be choir and custom dance performance from all district students to mark the school chapel saint day celebrations. You walked in to Sir Dudley Tuti College now; you will meet a young teacher who carries a big smile, always around the school office and willing to help you out. You may wonder and mistake him from any teacher in Isabel as he is no difference to a typical “Isabelian” – look, ways and behavior. But, it is a worst assumption that may have for him. He is Peter Woha, who comes from Maniate Village in Wainoni District. Makira Ulawa Province. Peter is doing his final year program at SINU – Diploma in English and Social Science. Peter is an energetic young teacher who is here at Sir Dudley Tuti College to do his 6 weeks practicum. He feels that there is nowhere under the sun that he regrets choosing SDTC as his practicum school. He loves every single moment of his entire time here. “People are so friendly and welcoming”, he said. Asked about what he acquired in this practicum, he commented, “Some things simply must be experienced directly to achieve professional growth and personal fulfillment. There are plenty of examples in every aspect of life. The same thing can be said of information and wisdom. They’re not the same thing. Indeed, you can gain a great deal of knowledge from books and school. But certain lessons can only be learned one-on-one, through direct experience, or they won’t sink in”. Peter has certainly has learned something and get real experiences. Peter plans is he would like to go out and face reality, put to test and enjoy the Teaching Profession before he goes back to Uni to do further studies. The Staffs and Students at the College would like to wish him and three other SINU students all the best in their studies. Hope to see them next year coming back to teach at SDTC. WELCOME BACK MR. CHRIS VIDMAR BUGORO…. Mr. Chris Vidmar Bugoro commonly known as “Rasta Chief” is back at Sir Dudley Tuti College. He has return to take up post at the College. His study programme at the USP, Alafua Campus, Samoa has been suspended until 2014. The Staffs and Students at the College warmly welcome Mr. Chris back and as he is not new to SDTC he has fit in well with the College programme. “Sir Dudley Tuti College” has a very special meaning to me. My wife and I as well as my Children, (particularly my Son “Rowan”) have managed to create a secure and a cozy place everywhere we have lived, but of all those places that we have called Home there was none that answered to my inner longing,” Mr. Chris said is his quiet and reserved manner. The Sir Dudley Tuti College has a new Deputy Principal. He is Joseph Neilsen who comes from Guadalcanal Province. With a wealth of experiences in the field of education and Masters in Education and BED qualification, we believe he is a right person for the job. The Isabel Education Authority has appointed him after the former Deputy Principal has tendered his resignation om personal ground. That left the post vacant for some weeks. The IEA, BOM, School Admin, staff and students would like register our appreciation for Mr. Joseph for accepting the appointment. Welcome and all the best on your new appointment. The Examination Classes at Sir Dudley Tutti College formally starts today 25/07/13. The delay of the students arrival to school is making and teachers strike issue are the contributing factors to this late start. Although, students have started going to class period, it is observed that majority of the students are yet to arrive. The School Administration is requesting all Forms 3, 5, 6 and 7 students to report to school. A late fee of $50.00 will be charged to students who will arrive as of Sunday 28th July. New Timetable Semester 2 ..